A recipe from Sarah Raven’s Garden Cookbook which she says came from Madhur Jaffrey’s World Vegetarian. 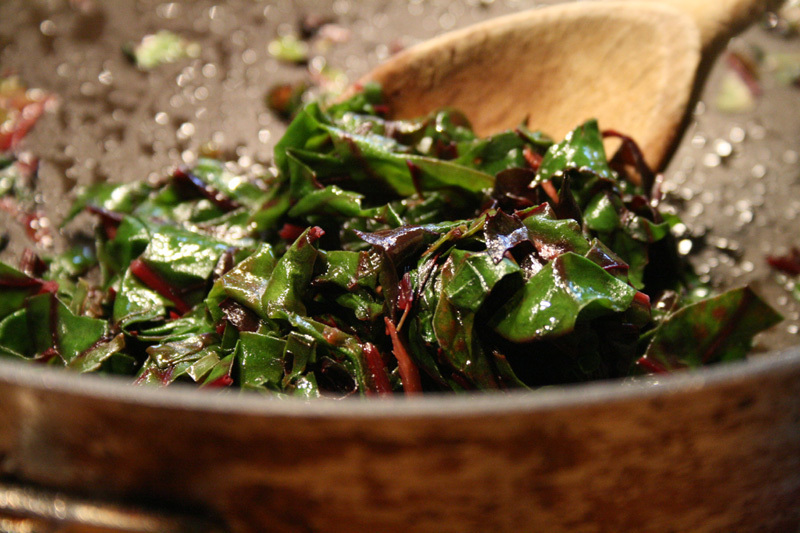 A good way of using those beetroot leaves and a nice change from chard or spinach. Strip the beetroot greens from the stalks and cut them into fine ribbons. Put the oil in a large pan and warm over a high heat. When the oil is hot, put in the chilli and ginger. Stir them around for a minute and then add the greens. Cover the pan, turn the heat to low and cook until the leaves have wilted. Add the salt and stir, then add 4 tbsp water and bring to a simmer. Cover again and cook on a low heat, stirring occasionally, until the greens are tender.